In this Focus Forty episode, I speak with Sarah Doody who is a UX Designer and creator of the UX Notebook to explore the Product Mindset and her love for doing side projects. 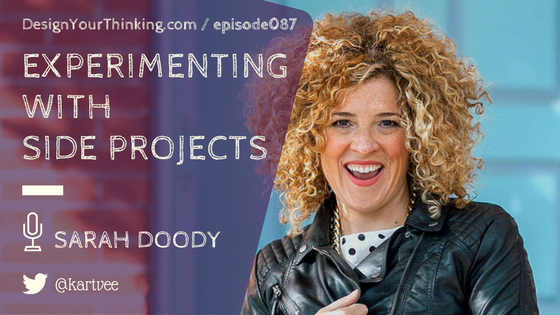 Sarah Doody is a user experience designer and product consultant based in New York City. She helps product teams create products people need and love. She does this through smart and fast research, prototyping, and experience design. Sarah also founded the popular weekly UX newsletter, The UX Notebook. She is also very involved in UX education. She created and taught General Assembly’s first 12-week User Experience program in 2011. More recently, Sarah created a course, User Research Fundamentals, to help teams understand their customers through doing more research. What you will learn – Side projects, Fearlessness and more! How does Sarah manage to stay productive as a product person? Staying creative while being productive – How does Sarah manage this balance? Three “things” that come’s to Sarah’s mind, that she believes product designers and makers should focus on in developing a product mindset? To be continued in Episode 88.